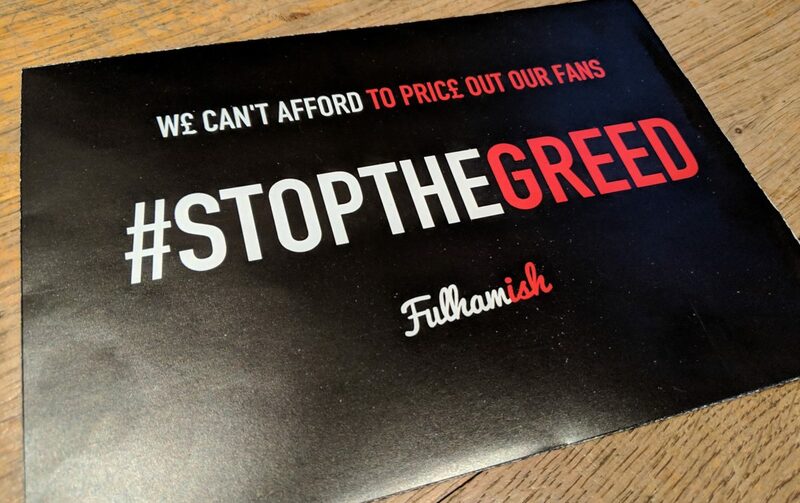 To clarify, the #StopTheGreed protest is about sending a clear message to Fulham Football Club that the exceptionally high match-day ticket prices are severely damaging the club and its future fanbase. It is aimed at the club as a whole, and is not linked to the performances seen on the pitch this season. For more on the origins of the movement, please read our initial article here. Despite the news that the club will not permit our banners to enter the stadium, the protest will still very much go ahead. Here are some plans for the day. Flyers: We have 10,000 flyers (pictured above) and we’ll be handing them out ahead of the match to supporters. If you would like to volunteer to hand them out, please meet us at 10.30am by the Johnny Haynes statue. Banners: We will still bring the banners to Craven Cottage and we will be displaying them on Stevenage Road. Again we will need volunteers to hold these banners high. If you see them, please take photos and share on social media with #StopTheGreed. 55th Minute: We would encourage you to hold your flyer high during the 55th minute of the match, to mark the £55 cheapest ticket available on Saturday. We would also like a chant of Stop The Greed to be started (same tune as En-ger-land / Han-ger-land). There have been many other suggestions including walkouts and taking the signs into the ground regardless of the club’s decision. Our priority is to get the plans above into action, however we encourage any respectful organic action that helps spread the message against FFC’s high match-day ticket prices. If you are unable to make the game on Saturday, please show your support on social media by using #StopTheGreed. If you’d like to use some of our STG imagery, you can download any of our assets here. Finally, please take the time to read the Fulham Supporters Trust’s ticket price related findings following their recent survey of 2300 Fulham fans. It backs up that this is an issue representative of the wider fan base, and not just a select few on social media.